Organizations of all sizes and types capitalize on the power of mobility by deploying apps that help them improve service, personalize marketing, build stronger relationships with customers and boost revenues. In a surprisingly short amount of time, mobile devices have become indispensable to business. More than two-thirds of Americans own smartphones, while 45 percent own tablets. Those figures climb even higher among professionals. 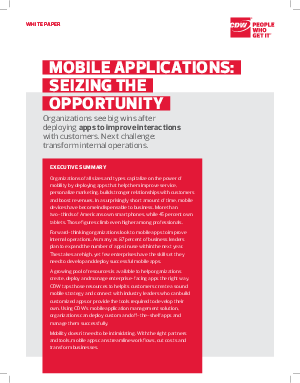 Forward-thinking organizations look to mobile apps to improve internal operations. As many as 87 percent of business leaders plan to expand the number of apps in use within the next year. The stakes are high, yet few enterprises have the skill set they need to develop and deploy successful mobile apps.